One of the lessons we learned early in our cruising careers is that it is the people – land based, and cruisers – rather than the places, which make this lifestyle so wonderful. 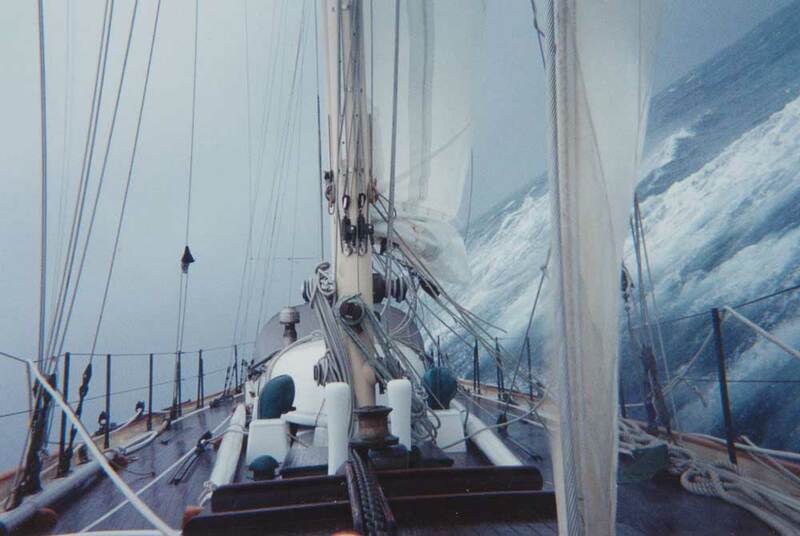 This post is about a special couple who are the modern definition of iron crews in wooden ships, and their remarkable yacht, Sina, shown above in a storm off Cape Horn. We first met Noel and Litara Barrott in Capetown, South Africa, in 1979. 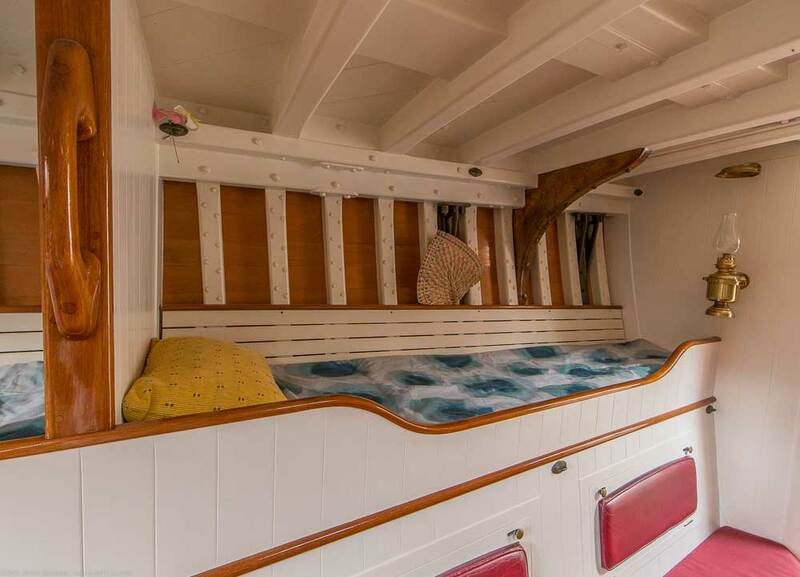 They were headed back to New Zealand from the UK aboard Masina, a lovely John Brooke designed cutter, which Noel and Litara had built in Whangarei. 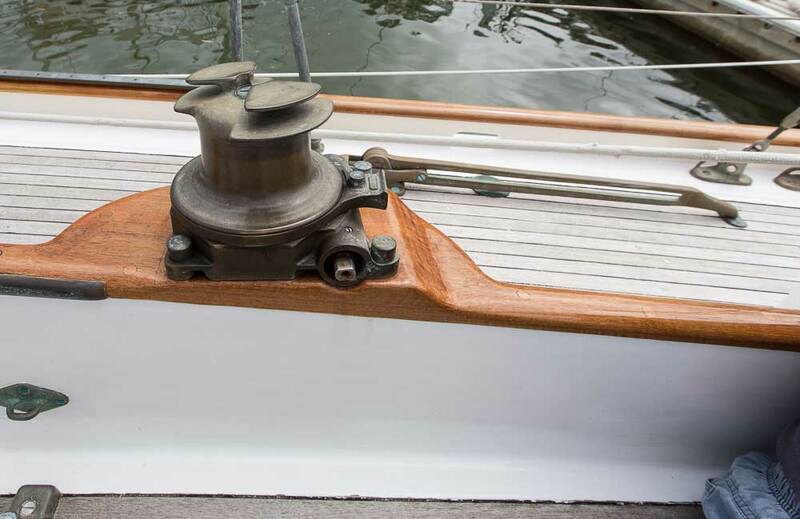 Masina was long, low, quick, flush decked, and did not have a self steering gear. When we asked Noel why they did not fit an Aries, then the standard, he replied “I don’t like the way they look.” This was after 60,000+ miles of hand steering. The Barrott’s taste for cruising grounds runs to the higher latitudes. After our meeting in Capetown they returned to New Zealand via the Southern Ocean. 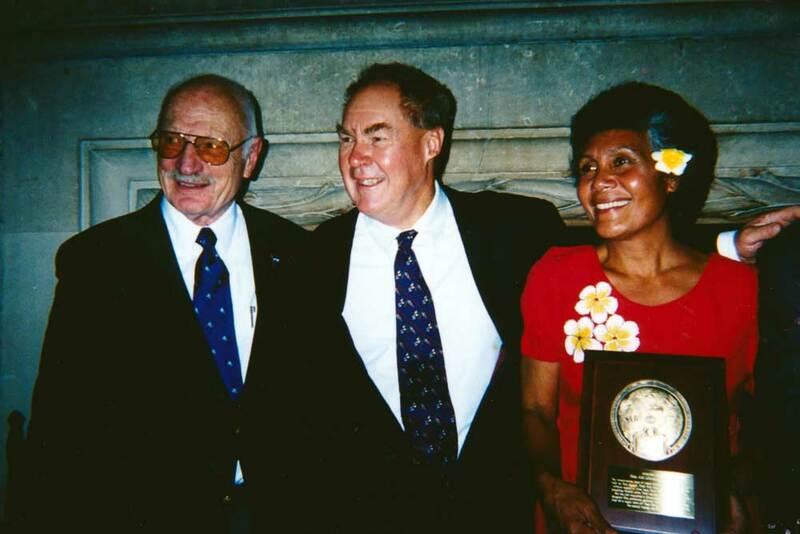 Fast forward to Vavau, Tonga, and 1995. We were taking Beowulf down to New Zealand to have Kelly Archer fit her out. 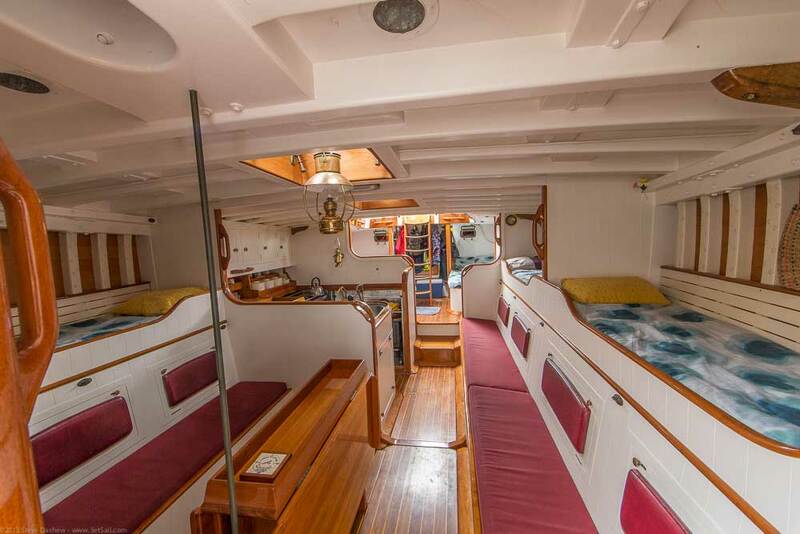 Noticing a powerful 50-foot ketch at anchor with Whangarei painted on the stern, we inquired aboard if the crew knew our friends the Barrotts, also of Whangarei. “Mom, Dad, there is somebody up here who knows you,” was the comment from the young man in the cockpit. Sina was then on her first cruise. 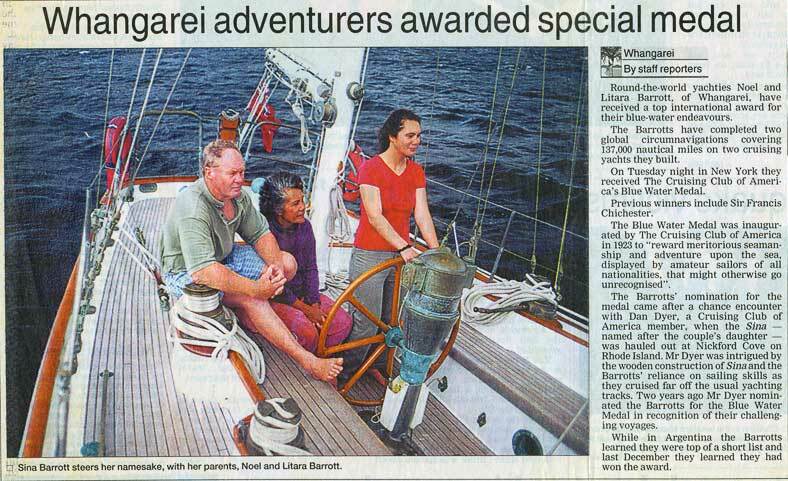 She has since accumulated 80,000 miles, mostly in the higher latitudes, before returning to Whangarei, for which they have received the prestigious CCA Blue Water Medal. 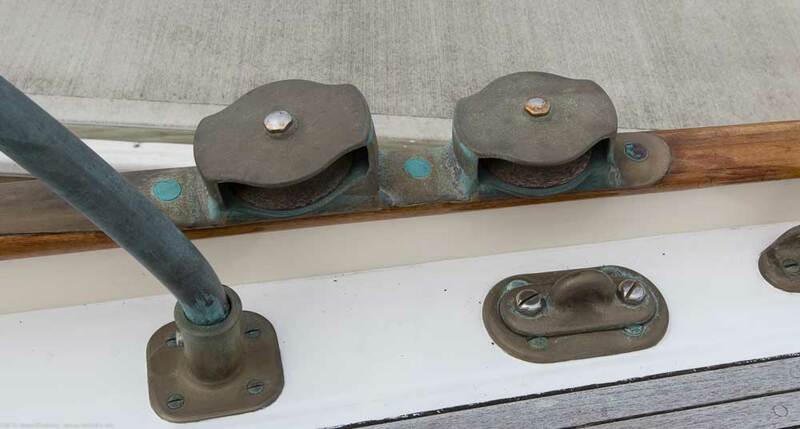 On our recent trip to New Zealand, taking a Sunday break to relax by checking out the marina, we noticed a familiar shear line. Noel and Litara were aboard, and we had an enjoyable, albeit brief reunion. 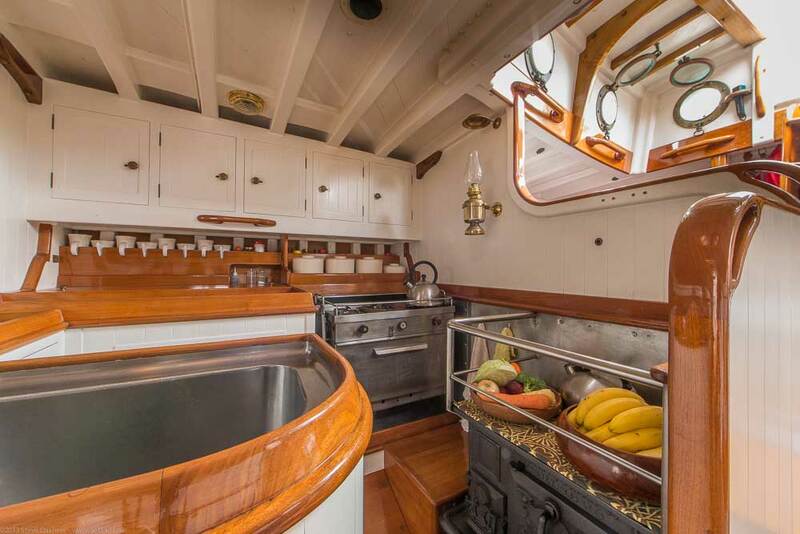 Sina is such a classic yacht that we thought you might enjoy a few photos – which do not begin to do her justice – and some details Noel and Litara have shared (at the end of the post is a recap of where Sina has taken the Barrotts, along with a fascinating account of a knockdown on the way to Cape Horn). 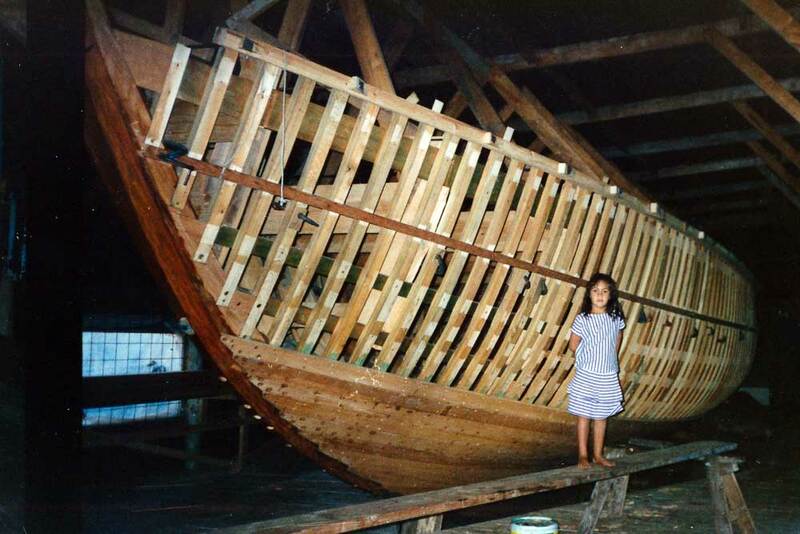 Noel is a master boat builder of the traditional school. And the combination of beautiful timber and light surfaces still looks good. 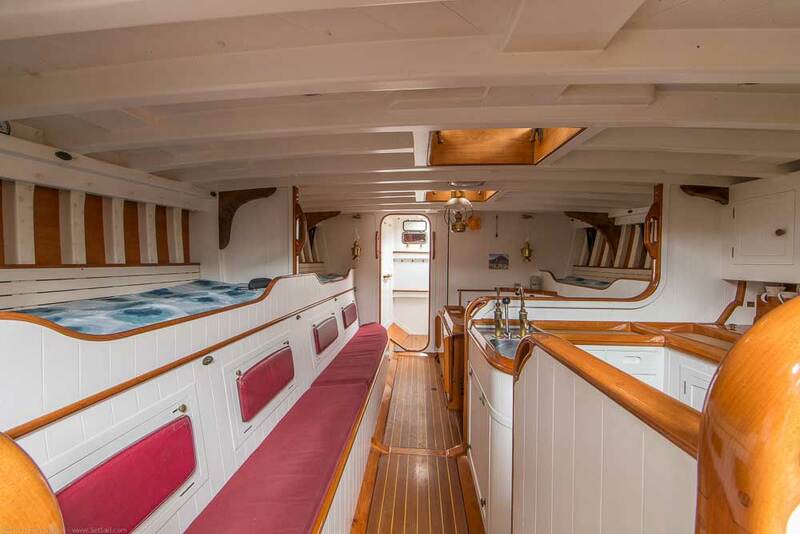 and quarter berths aft, is a layout proven by centuries of use. It still makes sense today. 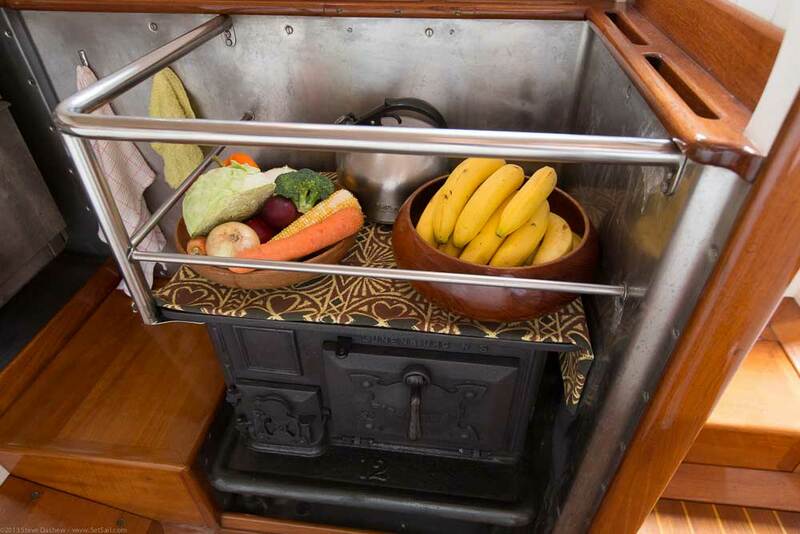 It is hard to beat one of these stoves in the high latitudes. are still looking good after all those miles. The head is forward, with a watertight bulkhead securing the forepeak. The forepeak provides lots of storage, while keeping the working gear, and its odors, isolated. 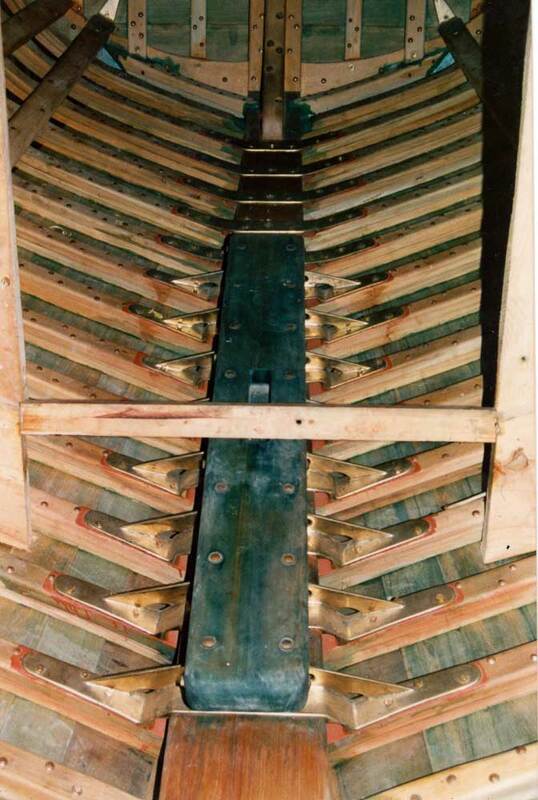 Notice the chain stored well aft, to reduce polar moments (pitching) and improve upwind performance. There is even a diesel engine, now with 3000 hours (which works out to about 150 hours a year). 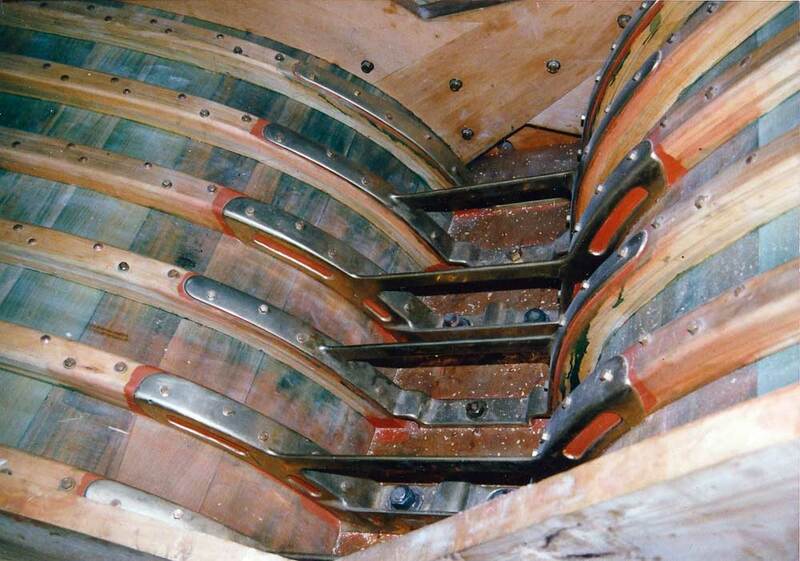 Noel made his own hardware patterns in the Merriman tradition, and then had bronze fittings cast. 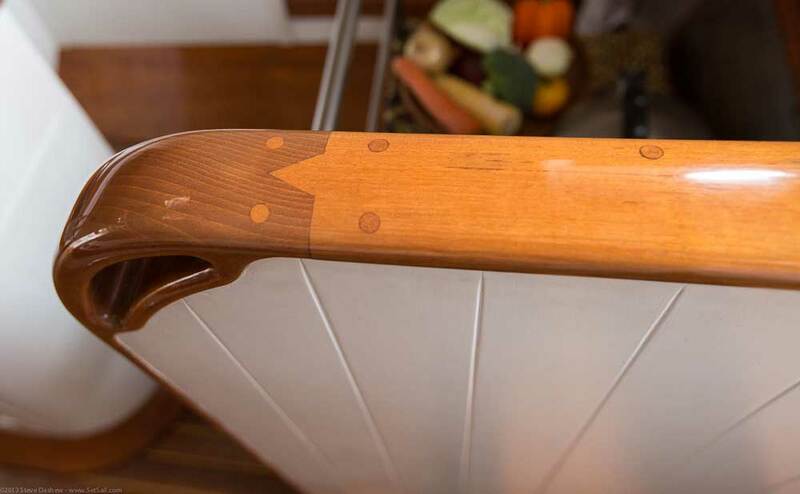 Where these sort of details are often the result of an inexperienced dreamer looking at coffee table books of photos, there is nothing aboard Sina that is not based on the Barrott’s experience. 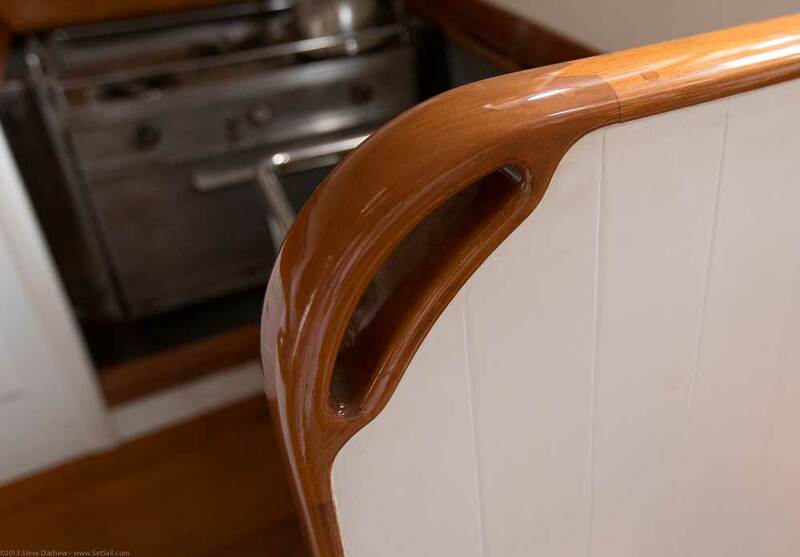 Which starts with the stout scantlings of this Colin Mudie designed cutter. Sina, the Barrott’s daughter, stands patiently by as a model. Did we mention strong? If you are going to cruise the high latitudes strength is not an option, it is an absolute necessity. And that begins with the keel floors. 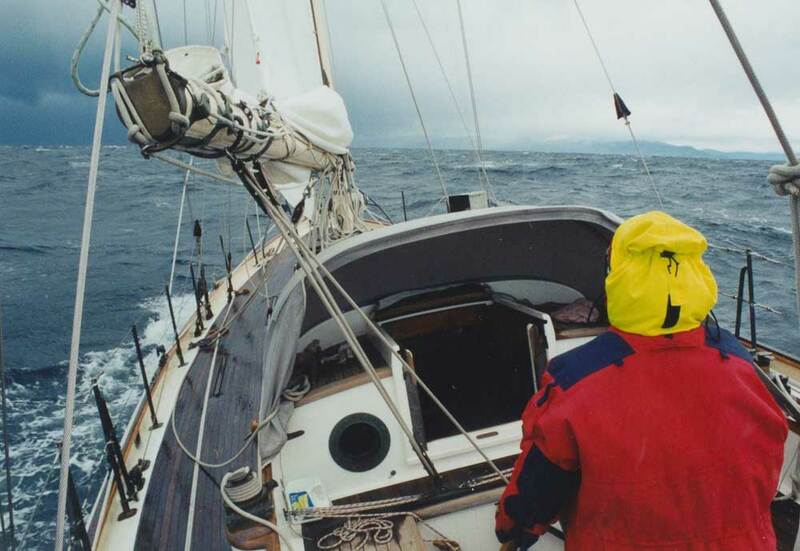 1995 Winter (antipodean) circumnavigation of North Island, cruised South Island. Then to Sydney, Australia by way of Kermedec group, Minerva Reef, Tonga archipelago, Samoa and Fiji. Circumnavigation of Australia, thence North and West again to Darwin. Crossed Indian Ocean to Richards Bay–South Africa via Ashmore Reef, Christmas Is, Cocos Keeling, Rodriquez, Mauritius, La Reunion, Richards Bay. We then visited Durban, Port Elizabeth, Knysna, Hout Bay, Cape Town, Dassen Is and Saldahna. To Namibia including Luderitz and Walvis Bay. Brazil from Abrolhes Is and coastal cruised to the Rio Para and Belem. Crossed over to the Amazon, ascended 500 miles to Santarem, then cruised the Rio Tapajos, a crystal clear tributary with sandy shores. Departing the Amazon, made French Guyana including Devil’s Is and the Kourou River. Then cruised the Caribbean, from Trinidad through the groups to Antigua. Thence to Lunenburg, Nova Scotia, then coastwise as far north as the Bras d’or Lakes and St Anne’s then south through the continental east coast to Pt Pleasant New Jersey where we wintered. North in the spring (2000), ascended the Hudson to Saugerties then ‘down east’ once more including the Maritime provinces of Nova Scotia, Newfoundland and Labrador. We had a great run through the Strait of Belle Isle meeting our first Greenland Icebergs. Wended our way west and south, (Fall colours in Maine and Cape Cod Canal), to Pt Pleasant, New Jersey. Early 2001, made a winter passage to St Mary’s Inlet, Florida/Georgia, (Cape Hatteras living up to its reputation enroute). Departed Georgia (well stocked with oak firewood) to Maine (Belfast for coal). From Maine to St Johns Newfoundland. From Newfoundland to Reykjavik, Iceland. Cruised west and north coast of Iceland (ascending Drangajokul glacier on one shore excursion. Thence to the Faroe Islands Cruised from north to south, experiencing whale herding in Fuglafiord and puffin netting in Torshavn. Our diet included whale meat, sun dried mutton and puffins. From Sandoy, made direct to the Canaries for a tropical sojourn. From the Canaries direct to Buenos Aires, Argentina, also cruising the delta above Buenos Aires. To Caletta Hornos in Patagonia experiencing a severe knockdown off the Valdez Peninsula. From Caletta Hornos transited the Strait of Le Maire, cruised the south coast of Tierra del Fuego and the southern part of the Beagle Channel. We then cruised to Cape Horn, getting ashore in separate parties, ascending to the lighthouse, chapel and the spectacular monument in rememberance of the ‘Cape Horners’. After rounding, returned to the Beagle and cruised north exiting at Cook’s Inlet and making Puerto Mont, Chile having layed-to streamed warps for sometime en route. Puerto Mont to Coquimbo, (Bahia Herradura). From French Polynesia to Palmerston Atoll (Cook Is) and Samoa. Retuned to Whangarei, New Zealand, Dec 2002. You don’t spend as much time in these latitudes as have the Barrott’s without a few challenges. When the chips are down, and the game of life is being played to its fullest, this is when both crew and yacht come into their own. 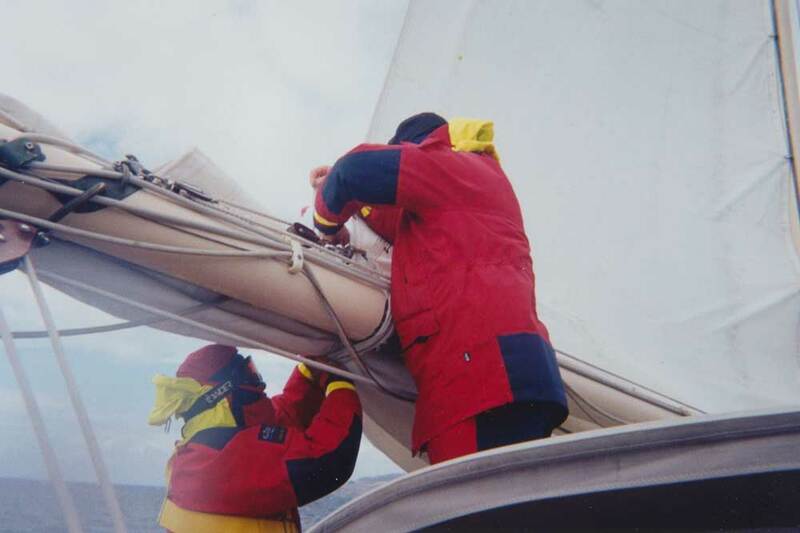 Crew must take care of their yacht, and in turn, the well designed, carefully built yacht will reciprocate. The reprint which follows is from Noel and Litara’s daughter, Sina (now a medical doctor). They are headed to the Horn, in an area infamous for its breaking seas, where many a vessel has gone missing. We think the story speaks for itself, both as to the design and construction of Sina’s namesake, and the seamanlike manner in which all of the crew did their jobs. 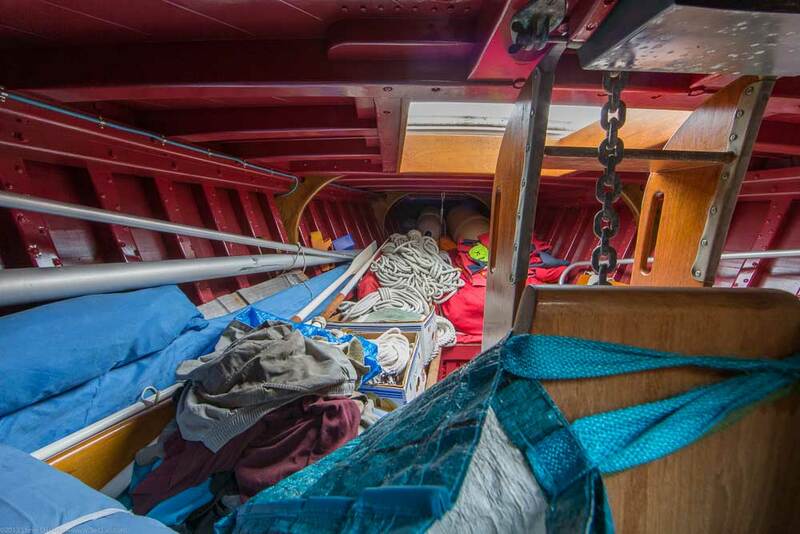 In an era when the slightest problem has some sailors reaching for the EPIRB, this is an excellent example of how the business of cruising in difficult circumstances should be conducted. Noel and Litara have decided to sell Sina. You can contact the Barrott’s at yachtsina@hotmail.com for more information. The new owner is going to be a very lucky individual, indeed. 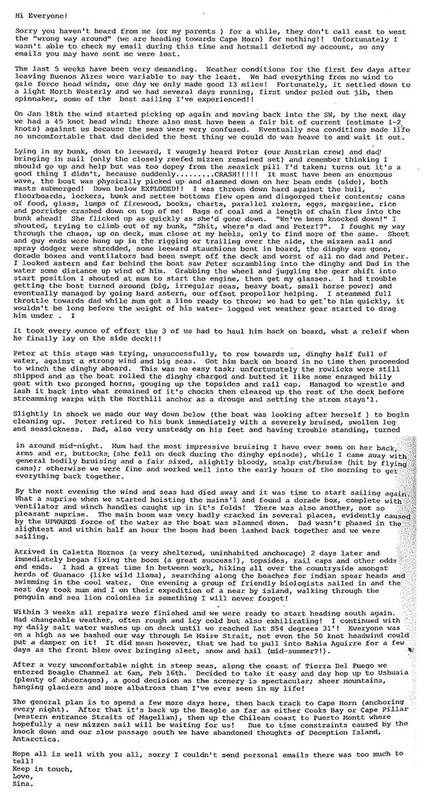 This entry was posted on Saturday, February 2nd, 2013 at 12:11 am and is filed under Dashew Logs, four. Both comments and pings are currently closed. 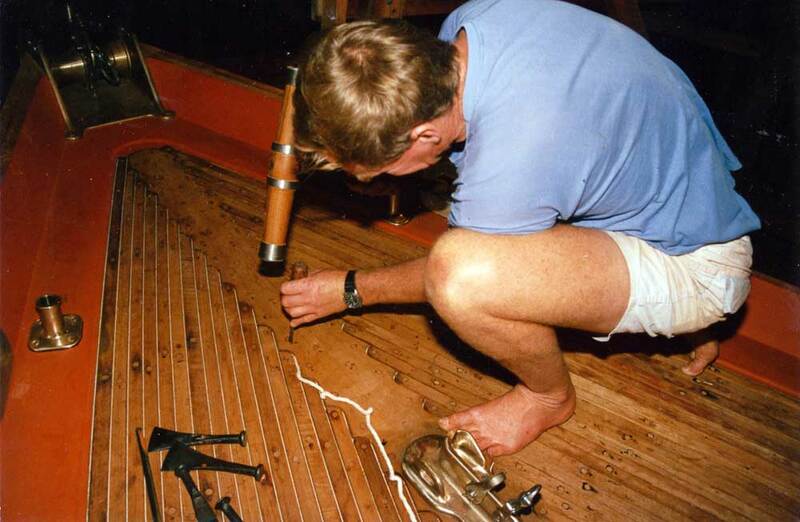 As a wooden boat fanatic, I just loved those photos! 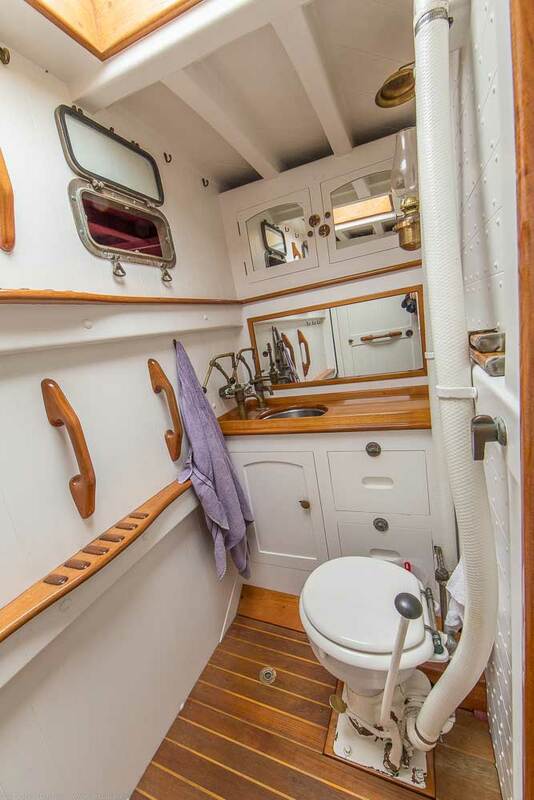 The Barrott’s cruising adventures also seem to belong to a bygone age, when self-reliance was the only option at sea, before the era of EPIRBS, GPS and so on. Hi J & J, I hope to catch up with you guys in the not to distant future, If I hade a enough spondollies this Fine Yacht would be my home. Regards. Hi Graeme, nice to hear we are all still here. Do you have a contact email for Noel and yourself?? 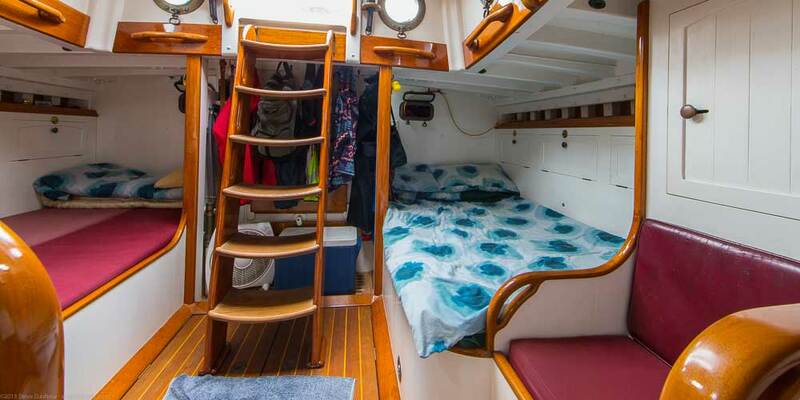 After doing a few other things I am currently doing up a 1981 Ron Holland designed Swan 42. 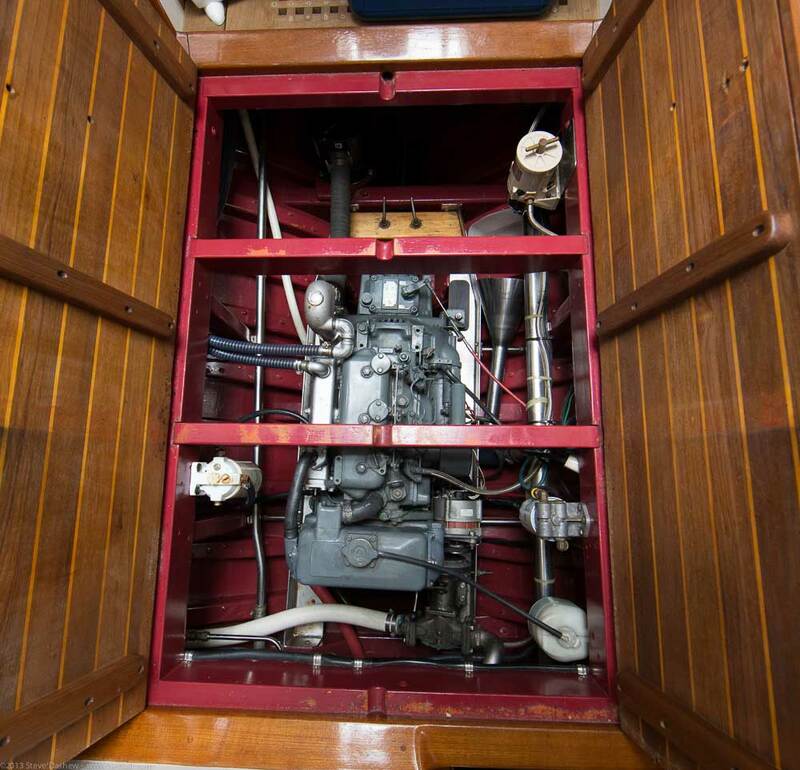 Nice boat, racing deck, ( 11 winches ) very sound and for its age fast. However the finishing workmanship is a million miles from LFD, lots of covering boards etc. gap and its interesting to sail the Swan by ourselves, I for one am not as fast as I was and Sydney Harbour is definitely not the set and forget of a big cruising boat. Hi James, I caught up with Noel very briefly on the Dock in Whangarei a couple of months ago. I actually don’t have his contact mail but he is easy to find. I have 2 Yachts!! a Classic 1956 carvel 31feet long 7foot 6inch beam, and a 1988 Cavilear 39mk11 offshore Yacht a recent purchase. My e mail…graemesalter@ihug.co.nz will be good to catch up.